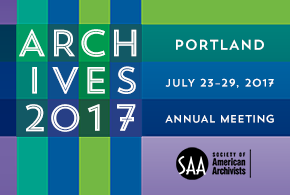 Videos of select sessions and exclusive “man-on-the-street” interviews are on SAA’s Facebook Page at http://facebook.com/archivists. The entire #saa09 Twitter log—more than 2,800 tweets posted by attendees throughout the meeting!—is online at http://twapperkeeper.com/saa09/. 2001 Annual Meeting in Washington, D.C.